Express support for the bereaved while honoring their loved one with this gesture of remembrance and comfort. They'll appreciate the selection of juicy, fresh-from-the-tree fruit. We’ve also included goodies like Caramel Drizzled Frosted Pretzels, Berry & Nut Trail Mix, Peanut Brittle and more. Arrives topped with a sympathy ribbon. 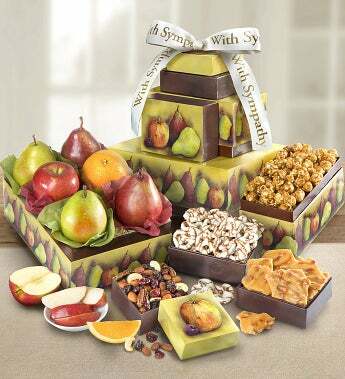 5 fruit-basket themed boxes topped with a beautiful hand-tied sympathy ribbon. D’anjou Pears, Bosc Pear, Red Pear, Fuji Apple and much more. When the fresh fruit is gone, the beautiful boxes are perfect for storage and organizing.